This class is an abstract base class for building io chains. This declares an abstract base class for a chain factory. The factory is used to connect an input pipe to the first pipe in the chain, and an output pipe to the last pipe in the chain. This will allow easy construction for buffer based io like services to for API centered IO while abstracting the input and output to simple data passing. To use this class, you should derive a class which implements the build method. Definition at line 76 of file llchainio.h. Definition at line 65 of file llchainio.cpp. Definition at line 70 of file llchainio.cpp. 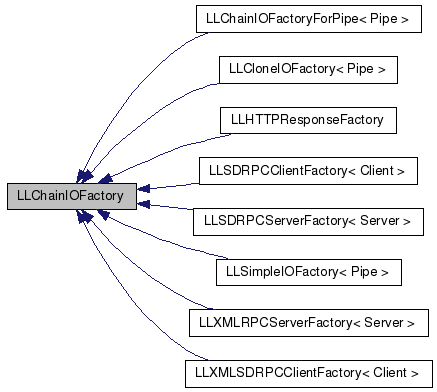 Implemented in LLSimpleIOFactory< Pipe >, LLCloneIOFactory< Pipe >, LLHTTPResponseFactory, LLChainIOFactoryForPipe< Pipe >, LLSDRPCClientFactory< Client >, LLXMLSDRPCClientFactory< Client >, LLSDRPCServerFactory< Server >, and LLXMLRPCServerFactory< Server >.